Product categories of Ethernet And Power Over Coax Converter, we are specialized manufacturers from China, Ethernet And Power Over Coax Converter, Coax To Ethernet suppliers/factory, wholesale high-quality products of Coax To Ethernet Adapter R & D and manufacturing, we have the perfect after-sales service and technical support. Look forward to your cooperation! EOC is a device for Ethernet transmission over coax featuring Coax to UTP connectivity, equipped with one Ethernet port and four BNC ports, which can make a ring or aggregation. So it can be used in pair or one to multi. The equipment can transmit signal over all kinds of common cables such as telephone line, Ethernet cable, UTP or coax etc., with excellent isolation, thunder prevention and anti-jamming function. In the practical project, this device is proved to be of high performance in surge prevention. It transmits IP video or Ethernet up to 1.5km at a max rate 70Mbps over existing coax, thus cut the cost by avoid re-cabling when swapping analog cameras for IP/Megapixel models. 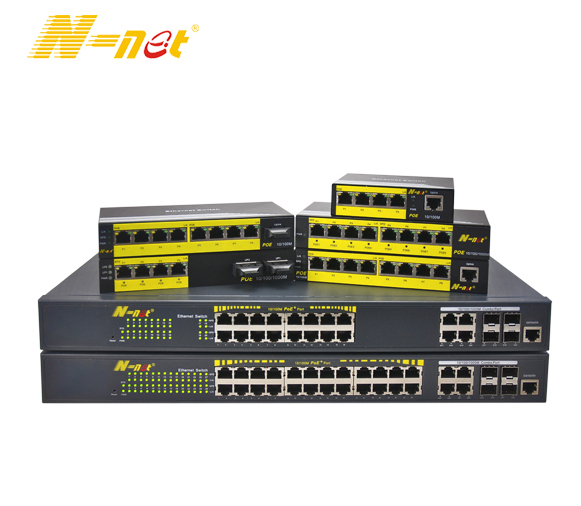 it can supply Power Over Ethernet cable for PD devices like HD cameras, wireless AP, IP telephone equipment. Our EOC support IEEE802.3af (15.4W) and IEEE802.3at (25.5W) standard. EOC series also supports POC (Power over Coax) function. Model at local side (namely the master) can supply power over coax cable for the model at remote side (the slave) and IP cameras.